 Turn a panettone into a fancy ice cream cake. Here’s the recipe from Proud Italian Cook. Filling the well with ice cream (photo courtesy Proud Italian Cook). A simpler take: no frosting needed. Here’s the recipe from Vincenzo’s Plate | Huffington Post. In past years, we’ve offered ways to turn panettone and pandoro—Italian holiday breads—into foods from fondue and tiramisu to PB&J and Nutella sandwiches. 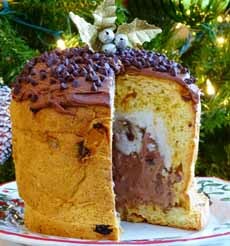 This year’s tip: Turn your your panettone into a holiday ice cream cake (the difference between panettone, pandoro and panforte). It couldn’t be easier. 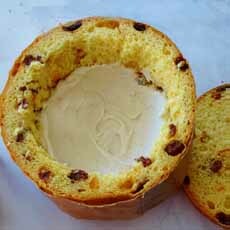 Just cut the panettone in half, scoop out a well in the center and fill it with ice cream. The sweet, yeasty dough, filled candied fruits and nuts, is a delicious complement to ice cream. Use any size or shape panettone. Use any flavor ice cream; although cherry, chocolate, pistachio, rum raisin and vanilla work particularly well. Make layers of two different flavors. Add a layer of brandied fruit, frozen cherries or any other frozen fruit. We adapted this recipe from Proud Italian Cook. Make this recipe one or two days in advance, so the ice cream can harden. 1. 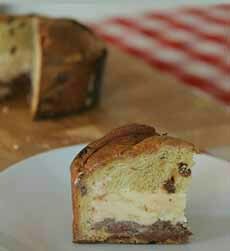 CUT the panettone in half horizontally with a serrated knife (if using two pints of ice cream, make the cut higher, at the 2/3 mark). Hollow out the lower portion, leaving a 1-inch base and sides. 2. BRUSH the cut surfaces of the panettone with the optional liqueur. 3. FILL the well with the first flavor of softened ice cream, packing it down firmly (photo #2). Add the optional layer bof brandied cherries. Top with the second layer of ice cream and firmly add the top layer. If using frosting you can frost the cut rim on the bottom layer as “glue” to help adhere the top (but you won’t be frosting the top until the next day). 5. REMOVE the cake from the freezer, place on a serving platter, and garnish the top as desired (photo #1). Slice and serve. Toast pieces of panettone and serve them à la mode. Make an ice cream sandwich on plain or toasted slices. Who first created these sweet holiday breads, and when? Here’s the scoop.